Just look at the last remaining cygnet now!! It's almost as big as Mum & Dad! The swans have left the nest here in Leabank Square - and sleep further downstream - next to Omega Works each night. This was inevitable - as unfortunately - they were getting a load of harassment from a few of the kids. So Mum & Dad packed up & took Junior off to safer pastures. But they make at least two stop-overs during the day as they sail past going upstream every day. More or less about 8am - and again at about 3pm. As you can see - Dad has gotten a load more chilled now that Junior is getting larger - and is taking food from Nadira's hand now - but Mum & Junior are still a bit too nervous to try this. They do - however - get very close. It's so sweet to see the parents not rushing in for the food - but allowing Junior to have his fill first. Once they think he's had enough - they then start taking for themselves. As far as food goes - they seem to prefer wholemeal bread - and ignore white of pitta bread. I've been doing some research - and it seems okay to give them bread - as swans get most of their food from the bottom of the river anyway - and top it up with some of our bread. So feel free to take a few slices up to the riverbank. Juniors feathers are still a mix of downy & teen shoots - so it will be a few more months before he can fly - but occasionally Mum or Dad flexes their wings and goes for a bit of a flight. Junior gets a bit excited at watching this - stretching his wings and flapping about a bit. Anyhow - please go up to the riverbank and enjoy our stunning new neighbours - before winter makes them think of maybe heading somewhere warmer. A few days ago - Caroline Davies came to Hackney Wick to do a story about our concerns for the future of the Wick a year before the games. She spoke to many people - but concentrated on James in the fabulous Hackney Pearl, the ever entertaining Al in White Post Lane - and me here in Leabank Square. Of course - no journalist can ever capture the sheer cliff-like monstrosity of the Olympic site that faces us - but I tried to put across what most of us feel about the architecture. More than anything - I spoke about what we all want after the games. 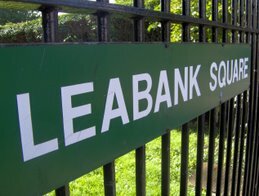 Leabank Square has always had the short straw as far as the construction work is concerned. We were the first to have buildings constructed - pulled down - re-constructed, pulled down again - and now rebuilding yet more temporary buildings directly opposite us - again for them to be demolished. then - we have about 5 more years of be-designing & building whoever takes over the media centre as well. There is not one part of the Olympic site that will have had noise, dust & mayhem - only to be left with the most underwhelming architecture for us to stare at for many decades to come!! I told Caroline all this - and I think she did a very good article on balance. She got over what most of us feel about all the decade of disruption the Olympics have brought to Leabank Square. Have you seen the very clever art exhibition on our green? At 1st glance it might just seem to be an orange plank - until you take a walk around the rest of Hackney Wick & Fish Island. You will notice a few more orange pieces dotted all around the streets. They are the work of the brilliant new artist Rowan Durrant. He has identified a few places where something has just been neglected - and has put them right - but in orange. We all know that PMMS have completely neglected Leabank Square for years - and have left some parts to rot away and decay. For this privilege - we have paid them shedloads of 'service' charge. The bench on the green has been broken for 3 years - and despite several attempts to get them to fix it - it takes an artist who doesn't even live here - to get it done. He's done the same in a few other spots around our streets. Signs the councils have just left broken - 'street furniture' the authorities have just never bothered to replace, rails etc. So whether you see our new installation as art, a message to some one in so called authority that they have failed, an audit of how western 'civilisation' is just not bothered - whatever your take is - just get out there and do it! !